On December 5th, 2014 we celebrated the birthday of the man and visionary that created a legacy of entertainment that no other man or group have managed to duplicate since. 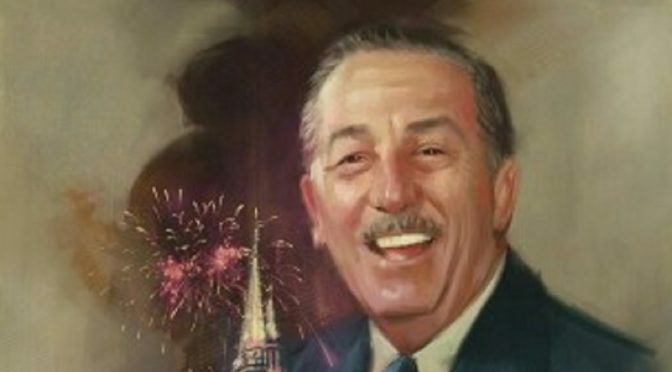 Walt’s commitment to family entertainment both in his movies and in his parks have inspired every generation since Snow White was premiered at the Carthay Circle Theater on December 21st, 1937. 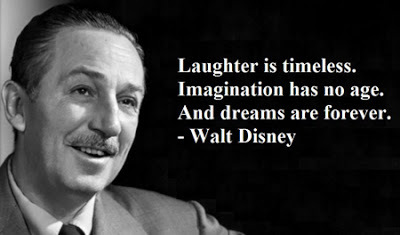 Walter Elias Disney was born on December 5th, 1901 in Chicago, Illinois to Elias and Flora Disney. Oddly enough, Walt’s parents were married on New Year’s day, 1888 in Kismet, Florida and lived briefly in Acron, Florida…just 40 miles north of where Walt Disney World would one day be built. Both Acron and Kismet are now ghost towns. Walt was the forth of five children: Herbert, Raymond, Roy, Walt, and sister Ruth. When Walt was 4, the family moved to Marceline, Missouri where Walt started growing a passion for drawing. Stories say that he used to practice drawing by copying the comic strips from the front page of the local newspaper. 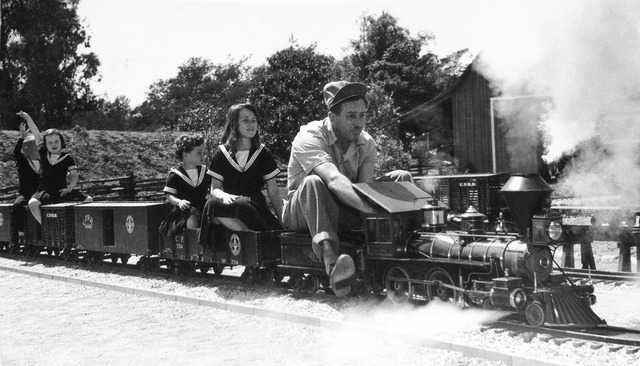 He also grew to love the railroad, which would later be evident in both his first park and his home where he built a working scale model of a steam driven locomotive. Here is a video from my favorite YouTuber, Justin Scarred and Randomland about Marceline, MO. In 1906, when Walt was about 4, his brothers Herbert (17) and Raymond (16) grew tired of the constant workload on the farm and receiving little to no money that they ran away from home. In 1911, Roy, Walt and Ruth moved with their parents to Kansas City, Missouri where Elias purchased a newspaper delivery route from the Kansas City Star with 700 morning deliveries and over 600 evening deliveries. Roy and Walt were instantly put to work helping their father deliver their newspapers. For six years, Walt would get up at 4:30 in the morning and deliver papers until school started and after school continue delivering papers until dinner time. All the work resulted in Walt receiving poor grades in school from falling asleep in class on a regular basis. When Walt was 16, Elias moved the family back to Chicago where Walt attended high school during the day and at night, took classes at the Chicago Academy of Fine Arts. Walt went to high school for less than a year before dropping out with hopes of joining the Army during World War I. Walt was rejected due to his age. He wound up joining the Red Cross and being sent to France for a year to drive ambulances just after the war was over. When Walt returned in 1919, he moved back to Kansas City with hopes of beginning his artistic career. When he was unable to sell any of his comic strips, his brother Roy used some friendship connections and got him a job at the Pesmen-Rubin Art Studio where he drew advertisements for local businesses. Walt was so successful at the Pesmen-Rubin Art Studio that in 1922 he decided to strike out on his own and opened Laugh-O-Gram Studios but due to poor money management, the company went bankrupt. Walt decided that to be successful his artistic career, he needed to in the heart of Hollywood, California. So Walt and Roy pooled their money and relocated to California in October of 1923 and opened the Disney Brother’s Studio’s on Hyperion Avenue. In 1925, Lillian Bounds was hired on to the Disney Brother’s Studio to ink and paint celluloid. Walt and Lillian started a short-lived courtship and were married on July 25th, 1925. 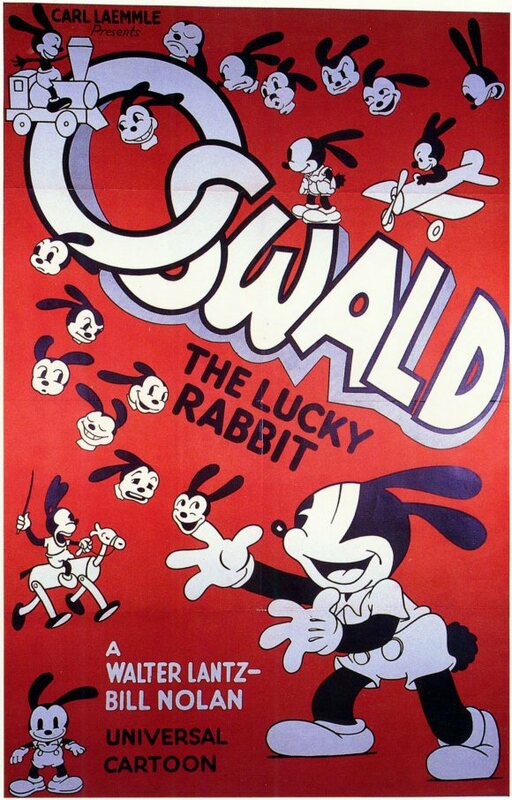 In 1926, Charles Mintz and Universal Pictures contracted with the Disney Brother’s Studios for a new animated cartoon series called Oswald the Lucky Rabbit. The character and cartoons were an instant success and in 1927, Walt went to Mintz to negotiate higher pay for his company. Mintz had a different plan in mind. He lowered the Disney Brother’s Studios pay and told Walt take it or he would open his own animation studio, take his animators (who were all now under contract to Mintz and Universal) and produce the cartoon himself. 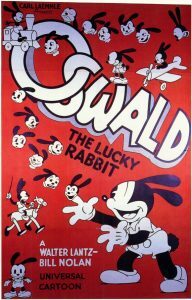 Walt refused, Mintz took Oswald and the animators (all but one who also refused to betray Walt) and produced the cartoons himself. In 2006, the Disney Corporation, through an odd negotiation that we might cover in another article, obtained the rights back for Oswald the Lucky Rabbit and now you can meet him and have your picture taken with him in Disney’s California Adventure. For the second time in Walt’s animation career, he was left with nothing. One thing I can say from the research I’ve done, Roy stood by his little brother through everything. I have never found anything to suggest that Roy wavered in his support for Walt and every time Walt wound up starting from scratch, Roy was there beside him. helping. I think that’s one thing that people don’t talk about as much as they should. A lot of the things we have grown to love over the years wouldn’t have been possible without the support Roy gave Walt. Now, Walt needed a new character. I’ve read countless stories of how “Mortimer Mouse” came to be and they all vary drastically. I’ve read that Walt felt he needed a new idea before returning to Disney Brother’s Studios in California. He didn’t feel he could return to his staff and tell them they had nothing. So Walt spent the train ride back from New York sketching various characters and before the train arrived, settled on a mouse character named Mortimer. Lillian told Walt that she felt the name Mortimer felt pompous and suggested Mickey. I’ve also read that Ubbe Iwerks, Walt’s last remaining animator, sketched countless characters including a cow (later to become Clarabelle Cow) and a horse (who became Horace Horsecollar). None of the characters Ubbe created sparked an interest in Disney. 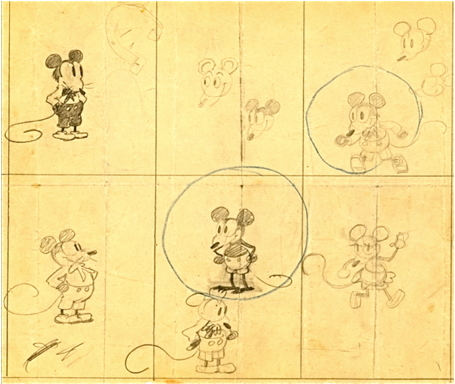 In 1925, an animator from the Laugh-O-Gram studios had taken a picture of Walt and had drawn little mice around Walt’s portrait. This sparked an idea in Ubbe to create a mouse character and Mortimer was born. The piece of the story where Lillian renamed Mortimer stayed the same. Now, I may be biased but I tend to believe the train ride story. That story of course, gives us the idea that Walt created Mickey rather than Ubbe. That version sits better with us diehard Disney fans. Walt was a marvelous story teller and had a way of telling stories in his favor. However, I tend to believe that Walt created Mickey because one of the Alice Comedies that were created in 1923 and 24 has a scene with a room full of mice that look very much like Mickey Mouse. 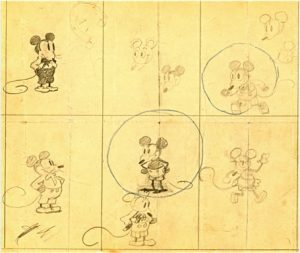 Walt and Ubbe created two cartoons with Mickey, Plane Crazy and Gallopin’ Gaucho but they could not get distribution for either short. 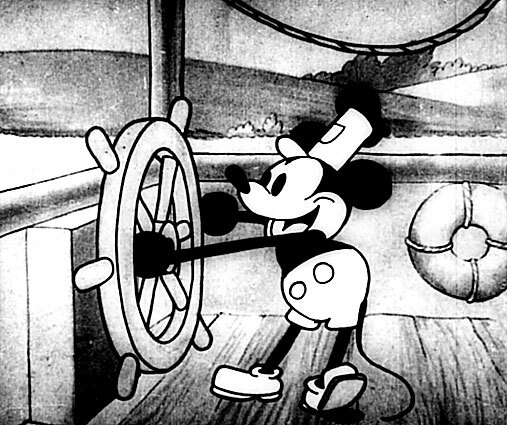 Then, Walt created Steamboat Willie which was the third short to feature Mickey Mouse, but it was the first one to feature sound. Through the use of a Cinephone, Steamboat Willie got distribution and was a success. Plane Crazy and Gallopin’ Gaucho were reworked to include sound and they too received distribution. Fast forwarding through the history, 1929 saw Silly Symphonies created and released. 1932, Walt received a special Academy Award for his creation of Mickey Mouse. 1933, Walt’s first daughter, Diane, was born. 1935 saw the creation and spin off of Donald, Goofy and Pluto. Donald quickly became Disney’s second most successful character. In 1936 Walt and Lillian adopted their second daughter, Sharron. In 1937, Disney Brother’s Studios ran out of money while creating Snow White and the Seven Dwarves. It had been started in 1934 and the movie industry called it Disney’s Folly because no one had ever made a full length animated feature and they didn’t believe that audiences wanted to or would pay to sit through it. Even Roy and Lillian tried to talk Walt out of the project. Walt pushed the boundaries of animation with advancements in realistic human animations and the creation of the multi-plane camera, which gave the feature a depth of imagery that had never before been seen in a cartoon. In order to obtain the funding necessary to complete the feature, Walt had to show a rough cut version to loan officers. 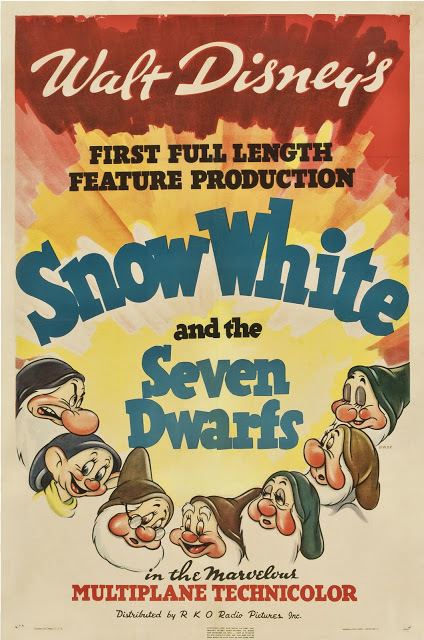 Snow White premiered at Carthay Circle Theater on December 21st, 1937 and earned $8 million dollars on it’s initial release, a sum equal to over $134 million in todays economy. The success of Snow White earned Walt’s studio an Oscar, which was awarded to him with one regular sized Oscar and 7 half size statuettes. A lot happened from there but we’re going to flash forward to the late 1940s, where Walt got the idea build a small amusement park across the street from his Burbank studios where his employees and their families could go and have fun together. Other stories that Walt told over the years were that he sat on a park bench while his daughters went on rides and he thought that there ought to be a place where children and parents could go and have fun together. All these versions end the same, Walt’s idea blossomed into a much larger idea than the empty lot across from the Burbank studios could contain. So Walt went out to Anaheim and purchased 160 acres of orange groves from the Dominguez family and a dream was born. For at least the second time in his career, he leveraged everything he owned for his dream of Disneyland. Skeptics thought for sure, this time, this would be the demise of the Disney Company. Disneyland was built for about $17.5 million, twice what Walt thought it would cost. The costs were so high that before opening day, he had to decide whether he wanted bathrooms or water fountains because he didn’t have enough money for both. Disneyland opened July 17th, 1955 with fanfare broadcast live on ABC with such talent as then actor, Ronald Reagan, Bob Cummings and Art Linkletter. Opening day was one of only two times that the drawbridge of Sleeping Beauty Castle has been raised and lowered. The second time was for the reopening of Fantsyland after an extensive remodel in 1983. 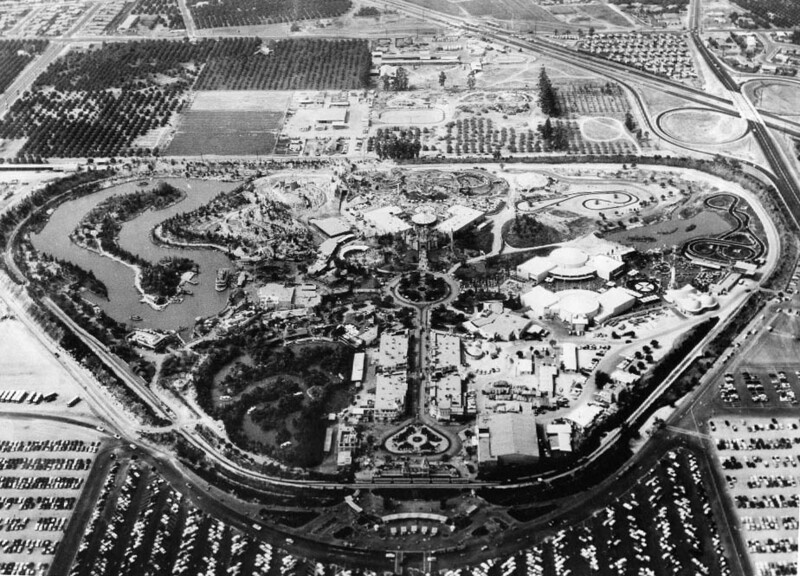 Disneyland became a passion for Walt that he would never let go of. The park continually underwent upgrades and expansions to entertain the masses. 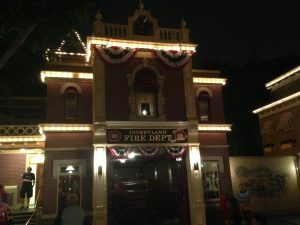 When Walt was building the park, he had an apartment built above the Main Street Fire Station and when he was in the park, a lamp by the front window burned to tell guests and cast members that Walt was on the property. Since Walt’s death, that lamp is continuously burning to tell everyone that Walt is there with us. In the early 1960s construction started on an expansion to Disneyland: New Orleans Square, where Walt was having a newer, larger apartment built for his family as well as another for Roy and his family. The apartments were located above the Pirates of the Caribbean entrance. Walt never got to see the new apartments completed or Pirates or his long envisioned Haunted Mansion because on December 15th, 1966, Walt would die from complications due to lung cancer. I can only imagine what the people that had been with Walt from the beginning were feeling and going through at that time. I wasn’t even born when he died and I’m still deeply touched every time I walk past his apartment above the fire station and see the lamp burning. I’ve even been known to stop and talk to his window and say a little goodbye on my way out of the park. I’ve never been able to fully understand my connection and absolute love for Disneyland and some days I don’t care to. I’ve told my wife before that if given the chance, I would gladly pack up and be part of the team of people that help shape and build the future of Walt’s vision. It’s up to those of us who have this passion to continue to push the park the way he would have wanted it. Happy Birthday Walt and thanks for reading.